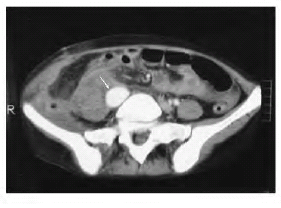 Acute appendicitis is uncommon after renal transplant. Infection with Candida albicans can produce serious complications by compromising the vascular anastomosis. In such cases, the origin of Candida albicans is often in the gastrointestinal system. Here, we report 2 uncommon complications that occurred in the same patient. A 27-year-old female renal transplant patient with appendicitis presented to our institution with acute graft failure. The patient was treated with an appendectomy and a transplant nephrectomy. Subsequently, the patient had a mycotic pseudoaneurysm rupture of the external iliac artery secondary to Candida albicans infection that originated possibly in the gastrointestinal system. This complication was further treated with a cross-femoral bypass. The occurrence of these 2 complications together is rare. Several gastrointestinal complications after renal transplant have been reported. Acute appendicitis is, however, not commonly reported after a renal transplant.1, 2 Infection is a frequent cause of morbidity and mortality in solid organ transplant recipients. Infection with Candida albicans can produce complications mainly by compromising the vascular anastomosis; and in such cases, the origin of Candida albicans is often in the gastrointestinal system. Candida arteritis leading to aneurysmal dilatation and rupture of the renal artery is a rare but dreaded complication of the renal allograft operation.3-6 Here, we describe the first case of mycotic iliac artery aneurysm rupture secondary to perforated acute appendicitis in a renal allograft recipient. A 27-year-old woman received a renal allograft from a deceased donor, and the transplanted renal artery was anastomosed end-to-side to the right external iliac artery. Initial immunosuppressive management was begun with antithymocyte globulin in doses of 2 mg/kg and prednisone, and continued with tacrolimus (dosed according the daily drug levels), mycophenolate mofetil, and oral prednisone. The patient had an immediate recovery of graft function. Eleven days after the transplant, the patient developed a sudden decrease in diuresis with acute renal failure. Based on a Doppler ultrasonography, the graft renal vein thrombosis was suspected. There were no other clinical symptoms of abdominal disease and no preoperative signs or findings suggestive of acute appendicitis. The patient was given an emergent operation. She was operated on for suspected renal vein thrombosis diagnosed by Doppler ultrasonography. However, we observed that the peritoneum was firmly adhered to the hilum of the transplanted kidney, and that the hilum and perihilar region were severely inflamed. These findings led us to suspect an intra-abdominal inflammation that could affect this region, so we opened the peritoneum and saw that the primary cause was appendicitis. We concluded that graft loss was secondary to graft renal vein thrombosis. Further evaluation and exploration revealed that the reason for the graft renal vein thrombosis was a perforated appendix. An appendectomy was performed, and the graft was removed. After placing side vascular clamps (Satinsky) and breaking down the anastomoses, the iliac artery and vein were primarily repaired without using any synthetic material. There were no histopathologic signs of graft rejection including humoral or cellular. C. albicans was isolated from the postoperatively drained culture. The patient underwent treatment with intravenous fluconazole (400 mg/d/wk) and chronic hemodialysis. Fifteen days after the graft loss, the patient was readmitted to the hospital for abdominal tenderness and hypotension. Sonographic evaluation suggested an external iliac artery aneurysm, which was confirmed by computed tomography (Figure 1). Intraoperatively, the pseudoaneurysm was resected; distal and proximal trunks of the iliac artery were ligated; and a cross-femoral bypass was performed with a synthetic vascular graft. The length of the aneurism was approximately 5 cm long, and it was not possible to perform a tension-free end-to-end anastomosis, because the area was inflamed and contaminated. Therefore, the proximal and distal ends of the iliac artery were closed after excision of the aneurysmatic segment and the retroperitoneum. Iliac arterial flow was provided with a cross-femoral bypass that was done via another incision. A polytetrafluoroethylene graft was placed subcutaneously over the pubic bone. A histopathologic study of the iliac artery wall indicated a mycotic aneurysm (Figure 2). Infectious diseases are major complications in patients undergoing an organ transplant. Although posttransplant-acquired infections are more frequent, transmission of pathogens (viral, bacterial, mycotic, and parasitic) from infected grafts also have been described.7 In such cases, particularly those secondary infections owing to pathogens originating from the gastrointestinal system, may lead to more-significant problems. Among these pathogens, fungi are important causes of morbidity and mortality but are generally rare in the first month after surgery. Treatment options, including aneurysmectomy, proximal and distal ligation of the arterial trunk, or percutaneous embolization. Removal of the graft also should be undertaken before it is too late to save the patient.9, 10 Optimal surgical management of infected aneurysms remains controversial. For the infrarenal aorta and iliac arteries, ligation of the arteries and extra-anatomic bypass grafts have been considered the criterion treatment for aortic sepsis to avoid the use of grafts in a contaminated region.10 Thus, the proximal and distal trunks of the iliac artery were ligated, and a cross-femoral bypass was performed with a synthetic vessel graft. In conclusion, a mycotic aneurysm of a grafted renal artery in renal transplant patients owing to infectious agents from the donor or from pathogens originating from the systemic circulation (eg, as in the case of our patient with acute appendicitis) has been shown in small series. However, this report demonstrates the first case of mycotic aneurysm of the recipient iliac artery in the postrenal transplant period. This pathology may occur in cases of clearly shown infection origin, as it did in our patient, even when chemotherapy specific to the particular pathogen is applied, and if overlooked, the condition may be fatal. Treatment should definitely involve extra-anatomic bypass with synthetic grafts considering the presence of contamination. Savar A, Hiatt JR, Busuttil RW. Acute appendicitis after solid organ transplantation. Clin Transplant. 2006;20(1):78-80. Hegde S, Moghal NE, Coulthard MG. Acute appendicitis occurring immediately post-renal transplant. Pediatr Transplant. 2006;10(1):119-120. Laouad I, Buchler M, Noel C, et al. Renal artery aneurysm secondary to Candida albicans in four kidney allograft recipients. Transplant Proc. 2005;37(6):2834-2836. Osmán I, Barrero R, León E, Medina R, Torrubia F. Mycotic pseudoaneurysm following a kidney transplant: a case report and review of the literature. Pediatr Transplant. 2009;13(5):615-619. Henderson A, Pall AA, Chakraverty S. Unsuspected mycotic aneurysm of renal transplant artery. Kidney Int. 2007;72(6):775-776. Fujikata S, Tanji N, Iseda T, Ohoka H, Yokoyama M. Mycotic aneurysm of the renal transplant artery. Int J Urol. 2006;13(6):820-823. Matignon M, Botterel F, Audard V, et al. Outcome of renal transplantation in eight patients with Candida sp. contamination of preservation fluid. Am J Transplant. 2008;8(3):697-700. Alamo JM, Gómez MA, Tamayo MJ, et al. Mycotic pseudoaneurysms after liver transplantation. Transplant Proc. 2005;37(3):1512-1514. Carr SC, Mahvi DM, Hoch JR, Archer CW, Turnipseed WD. Visceral artery aneurysm rupture. J Vasc Surg. 2001;33(4):806-811. Müller BT, Wegener OR, Grabitz K, Pillny M, Thomas L, Sandmann W. Mycotic aneurysms of the thoracic and abdominal aorta and iliac arteries: experience with anatomic and extra-anatomic repair in 33 cases. J Vasc Surg. 2001;33(1):106-113. Figure 1. Contrast-enhanced axial computed tomography image showing a right external iliac artery aneurysm (arrow). Figure 2. Picture showing fungi hypha in a necrotic vascular wall [hematoxylin and eosin (A) × 40, (B) × 100].